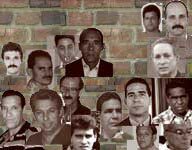 Why does Congress ignore these Cubans? Half a dozen members of the Congressional Black Caucus spent hours huddling with Fidel and Raúl Castro in Havana this week as part of a swelling campaign to normalize relations with Cuba. "It is time to open dialogue and discussion," Rep. Barbara Lee (D-Calif.) told a news conference in Washington after their return. "Cubans do want dialogue. They do want talks." Funny, then, that in five days on the island the Congress members found no time for dialogue with Afro-Cuban dissident Jorge Luis García Pérez. Mr. García, better known as "Antúnez," is a renowned advocate of human rights who has often been singled out for harsh treatment because of his color. "The authorities in my country," he has said, "have never tolerated that a black person [could dare to] oppose the regime." His wife, Iris, is a founder of the Rosa Parks Women's Civil Rights Movement, named after an American hero whom Afro-Cubans try to emulate. The couple have been on a hunger strike since Feb. 17, to demand justice for an imprisoned family member. They are part of a substantial and steadily growing civil movement advocating democratic change in Cuba -- one that U.S. advocates of detente with the Castros appear determined to ignore. In addition to the Black Caucus, the congressional campaign is led by longtime advocates for the Latin American left such as Sen. Christopher J. Dodd (D-Conn.), by farm state representatives eager to increase the $400 million in food the United States already exports annually to Cuba, and by Sen. Richard G. Lugar (R-Ind. ), the senior Republican on the Senate Foreign Relations Committee. Mr. Lugar dispatched staff members to Cuba this year to report on the prospects for improved relations; they also didn't meet with anyone from the democratic opposition. They did propose lifting all restrictions on travel to Cuba by Americans -- something that could give Cuba's state-run tourism industry a $1 billion annual boost -- and Mr. Lugar is now co-sponsoring legislation that would do just that. The congressional pressure, and that by leftist Latin American presidents who have been streaming to Cuba in recent months, is very likely to undermine President Obama, who has promised that "liberty" would be at the center of his Cuba policy. Mr. Obama is expected to announce a relaxation on travel and gifts to family members by Cuban Americans before next week's Summit of the Americas, and he has said he is open to dialogue with the regime. But he has also said that the lifting of what remains of the U.S. trade embargo should be linked to steps by Cuba toward democratic change. That is a sensible and forward-looking strategy, especially given the age and failing health of the Castros. But, for the moment, the brothers show no sign of offering such change -- in fact they have recently moved to foreclose the possibility, by purging two younger and relatively liberal-minded ministers. Fifty-four of the 75 leading democracy and human rights activists jailed six years ago last month are still imprisoned, along with hundreds of other political detainees. As long as Congress is moving to unilaterally dismantle U.S. leverage -- and shunning Cuba's democratic opposition -- the regime will have no incentive to compromise.